CRITICAL SAFETY ALERT – PLEASE READ! 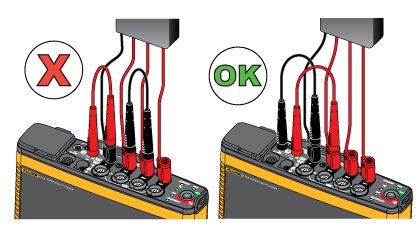 Fluke is issuing this Critical Safety Alert related to the 173x Series (Models: Fluke-1730, Fluke-1732, Fluke-1734, Fluke-1736 and Fluke-1738), the 174x Series (Models: Fluke-1742, Fluke-1746 and Fluke-1748) Power Quality Loggers and the 3540FC Power Monitor to warn users against a serious risk of potential injury or death. 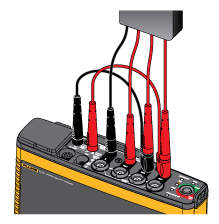 Fluke has determined that certain improper use of the test lead set, 3PHVL-1730 or 3PHVL-1730-5M ‘Voltage Test Lead, 3-phase + N’, included with the 173x Series,174x Series Power Quality Loggers and 3540FC Power Monitor, may potentially expose users to hazardous conditions, posing the risk of serious personal injury or death. While these test leads are compliant with applicable safety standards, it is possible for a user to miswire the voltage connections on the test lead set when making connections to a Logger. 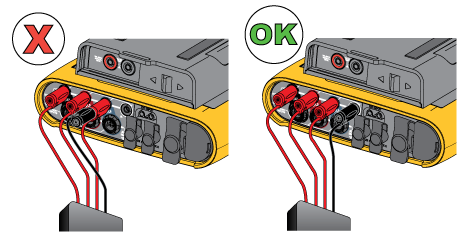 See the diagrams below for examples of miswiring errors. While the possible wiring errors shown below may seem obvious to trained personnel, if this miswiring were to occur, a phase-to-phase or phase-to-neutral short circuit could result, potentially causing an arc explosion and posing the risk of serious personal injury or death. PLEASE USE CAUTION TO AVOID ANY OF THESE MISWIRING CONFIGURATIONS. 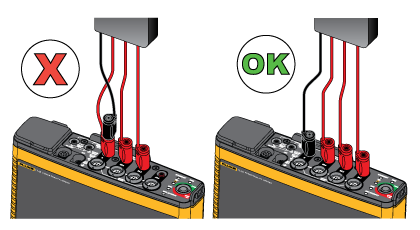 Fluke urges you to discontinue use of the ‘Voltage Test Lead, 3-phase + N’ cable set and contact Fluke for a free replacement test lead kit. This replacement test lead kit incorporates straight banana connectors rather than stackable connectors. To facilitate powering the Logger from the measurement terminals, the replacement test lead kit additionally includes short jumper accessories with both a stackable connector and a straight banana connector. The configuration of this replacement test lead kit eliminates the possibility of miswiring the terminals. See below. Replacement test lead set installed. Click this link and fill out the test lead replacement form including the model and serial number(s) of your Power Quality Loggers affected. The replacement test leads should be shipped from Fluke within approximately six weeks after receipt of your order. Once the new test lead kit is received, please cut the old-style test leads in half and discard.